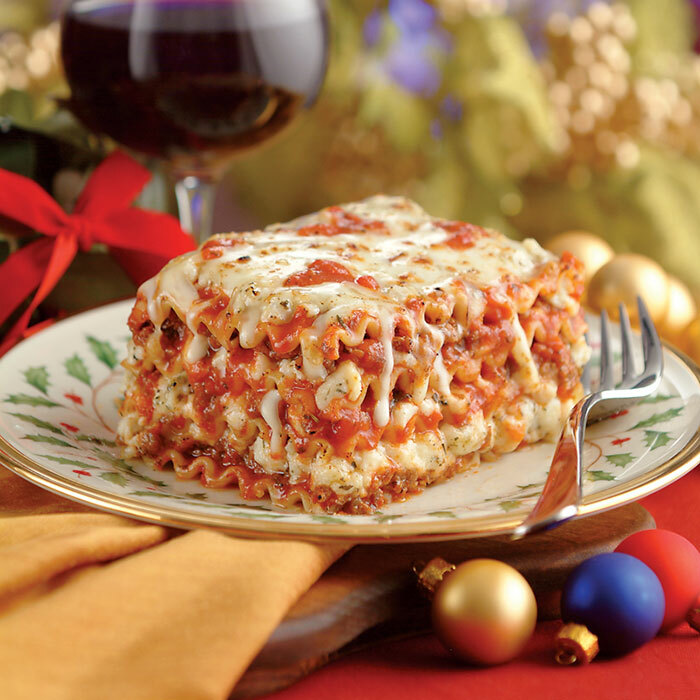 Gather the family around the dinner table and enjoy this hearty lasagna tonight! Add onions and garlic, and cook 4 minutes or until onions are soft. Add tomatoes, marinara sauce, Italian seasoning, salt and pepper. Heat to simmering and cook 10 minutes. In large bowl, combine ricotta cheese, 3 cups mozzarella cheese and 1-3/4 cups Parmesan cheese. Spray 13 x 9-inch baking dish with nonstick cooking spray. Spread 2 cups sauce into bottom of baking dish. Place 3 noodles over sauce, top with 1/5 of the sauce. Repeat 4 more layers of noodles, cheese mixture and sauce; top with remaining 1 cup mozzarella cheese and 1/4 cup Parmesan cheese.